Ciaran Mulligan’s Blue Insurance group is extending its popular win-a-car competition into the consumer market. 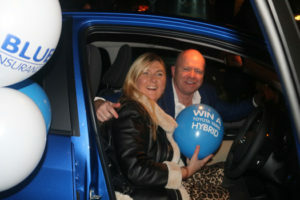 Blue’s multitrip.com brand, which has more than 450,000 Irish and British customers, is the offering the public a chance to win a Toyota this year. Donna Kenny of Cassidy Travel was the winner of a Toyota hybrid in the trade competition, in association with Toyota Sandyford, last month. Now customers who purchase singe of two-year travel insurance policies will be automatically entered into a draw each month to win a Yaris model from Toyota Sandyford. The 12 monthly winners will then be invited to attend the live final at the end of the year. Customers wishing to get an instant quote,should visit www.multitrip.com or call the company on 0818 44 44 44.